Bhyve Support by A-Team Systems: Professional. Secure. Reliable. Our professional and dependable bhyve support services let you leverage FreeBSD’s built in hypervisor to the fullest. Have Questions About Bhyve or Need Support Immediately? Unlock the power of FreeBSD’s native hypervisor! A-Team Systems has been working with FreeBSD for over 20 years, including bhyve since it’s debut in FreeBSD 10. We have hands-on experience with virtualizing almost every supported OS including CentOS, Ubuntu, and even Windows 10. This extends to converting existing VMware ESXi-based hypervisors to FreeBSD bhyve as well. Regardless of whether you are an experienced FreeBSD user yourself and are looking for a hand with bhyve, or someone who has inherited a FreeBSD server, we can help with anything you need. Overall we are FreeBSD support specialists and this includes bhyve. To us FreeBSD is not just another bullet item — it’s our preferred OS and the foundation we build our solutions on! 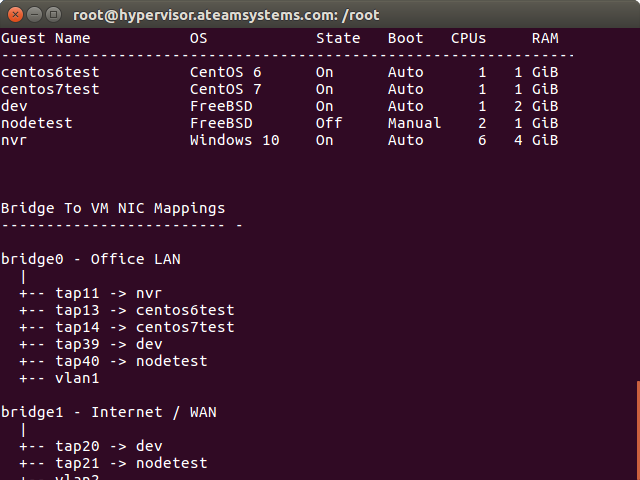 A-Team's tools for managing FreeBSD Bhyve VMs and their virtual networks lets you easily add dev, staging and production virtual servers to your existing FreeBSD environment. We’re here to help with any OS or software problem. Our streamlined update processes keep your servers continuously up to date while minimizing risk. A-Team Systems acts like an extension of your organization! Before DevOps was even a word, we’ve been helping our clients leverage technology to meet their goals. We pride ourselves in connecting with our clients to develop systems and work flows that are both secure and easy for developers to work with. Our decades of experience are at your disposal: From best practice advice to helping tune and automate your development and deployment processes, we’re here for you. Looking for an off-site backup service that goes the distance? Encrypted. Fully automatic. Accessible & restored with tools built into any UNIX operating system. Effortless, worry-free off-site backups by A-Team Systems. Business never stops, neither should your servers. We design and deploy complex systems, from high availability server clusters to multi-datacenter redundancy and fail-over support. Take a look at our FreeBSD-based A-Team Clustering System for more details on our flagship high availability platform.